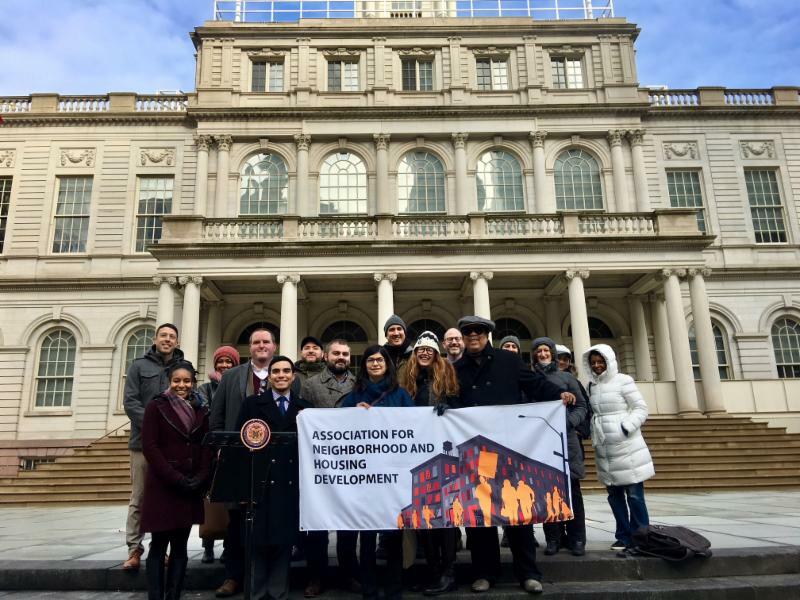 New York, NY - Today, the Industrial Jobs Coalition joined with City Council members to celebrate the upcoming passage of zoning protections for the City's 21 Industrial Business Zones (IBZs). These protections, meant to clamp down on competing non-industrial uses and ensure space for good-paying jobs, create the foundation for broader zoning reforms. The Coalition, having advocated for this crucial protection as a part of the Mayor's 2015 Industrial Action Plan, thanked members of the Council who led the charge through the land use review process. "The City Council is delivering a big victory for the manufacturing industry and the middle class jobs it brings to New York's underserved communities," said Council Member Donovan Richards, chair of the Subcommittee on Zoning and Franchises. "As promised in the Industrial Action Plan, we will continue to work towards preserving the essence of Industrial Business Zones. I'd like to thank my fellow IBZ colleagues, the Industrial Jobs Coalition and the City Council's Land Use staff for this truly collaborative process." "For the first time, New York City is actually putting teeth behind the IBZ designation," saidCouncil Member David Greenfield, chair of the Land Use Committee. "We are saying today that we will fight for industrial jobs in New York City. We are saying that good jobs are more important than self-storage facilities. I am proud to have been a leader in this fight and congratulate the coalition led by ANHD that fought for years to get us to this historic place." The proposal, which would limit self-storage via a City Planning Commission special permit in the vast majority of the IBZs, had broad support from the City Council and industrial advocates. While efforts to dilute the original proposal occurred during the land use review process, the collective effort of industrial advocates and the Council were pivotal in changing the proposal into its current version. Having passed both the Zoning and Land Use committees by wide margins, the full Council is expected to pass the text amendment in their final stated meeting on Tuesday. "We are thankful to this City Council for their continued leadership on industrial and manufacturing issues," said Benjamin Dulchin, Executive Director at the Association for Neighborhood & Housing Development. "Their partnership with the Industrial Jobs Coalition to advance common sense zoning reforms and protect the Industrial Business Zones from speculative uses means more good-paying jobs can stay in the city." "Enactment of a special permit requirement for self-storage facilities is a great victory for good jobs," said Adam Friedman, Director of the Pratt Center for Community Development. "We've been pushing for this for years as part of a comprehensive strategy to reduce real estate pressures on manufacturers. The Mayor promised it in his first campaign, and today he delivered on his promise." The current City Council has a strong record of focusing on industrial and manufacturing issues. Their 2014 report, Engines of Opportunity, laid the blueprint of current manufacturing discussions in the city. The 2015 Industrial Action Plan, launched alongside the Mayor and advocates at Greenpoint Manufacturing and Design Center, was largely based on the Council's recommendations. While multiple aspects of that plan have moved forward, members of the Council and advocates alike recognized the significant importance of use group reform. "Protecting and promoting industrial jobs is important for the City of New York and especially for my district. Passing this text amendment will help to ensure that businesses in the Industrial Business Zones serve real manufacturing needs, and that means more jobs," said Council Member Antonio Reynoso. "I am committed to continue working with the industrial communities of Williamsburg, Bushwick, and Ridgewood so that they thrive." "Strengthening New York City's manufacturing sector is an essential way to create good jobs for a wide range of New Yorkers, and to advance more inclusive growth in the innovation economy. I am thrilled to join my colleagues today in limiting self-storage in Industrialize Business Zones throughout the City, which undermine more job-intensive manufacturing uses," said Council Member Brad Lander. "In my district, this will help enable Gowanus to remain a vibrant, creative, inclusive, sustainable, mixed-use neighborhood. Thanks to Speaker Mark-Viverito and the tenacious industrial advocates and manufacturers for their grit and determination to keep 'making it' in New York City." "Thanks so much to the New York City Council for following through on their commitment to growing working class jobs in New York City's Industrial Business Zones. This is a great first step in achieving this goal," said Leah Archibald, Executive Director at Evergreen Exchange. "We look forward to working with the Council to address the proliferation of other non-compatible uses in manufacturing zones throughout the city. Special thanks to North Brooklyn Council Members Levin and Reynoso for their commitment to the local industrial community!" "This text amendment was a huge win for the South Bronx, and demonstrates our commitment to ensuring we can protect and promote industry and manufacturing jobs in New York City," said Council Member Rafael Salamanca. "I'm very proud of the work we did to make this a reality." "The special permit for self-storage in New York City's Industrial Business Zones is a crucial first step in protecting industrial and manufacturing jobs in the City," said Nancy Carin, Executive Director of the BOC Network. "Blue collar workers, a majority of which are working class immigrants and people of color, can rest easier knowing that City Council has recognized this critical opportunity to actively prioritize job creation and encourage growth of the industrial sector in New York City." "This new special permit requirement is a solid victory. Industrial businesses are truly the heart of New York City's economy - providing essential services and making decades of sacrifices on behalf of employees and our communities," said Ben Margolis, Executive Director, Southwest Brooklyn Industrial Development Corporation (SBIDC). "We are heartened to know that the City Council believes that IBZs are dedicated places to prioritize our city's industrial community, and that it is working to implement the Administration's own 10-Point Industrial Action Plan."